Public lands ranching subsidizes large livestock operations owned by millionaires and billionaires. Who’s overgrazing BLM lands? Subsidized livestock. BLM data shows it. 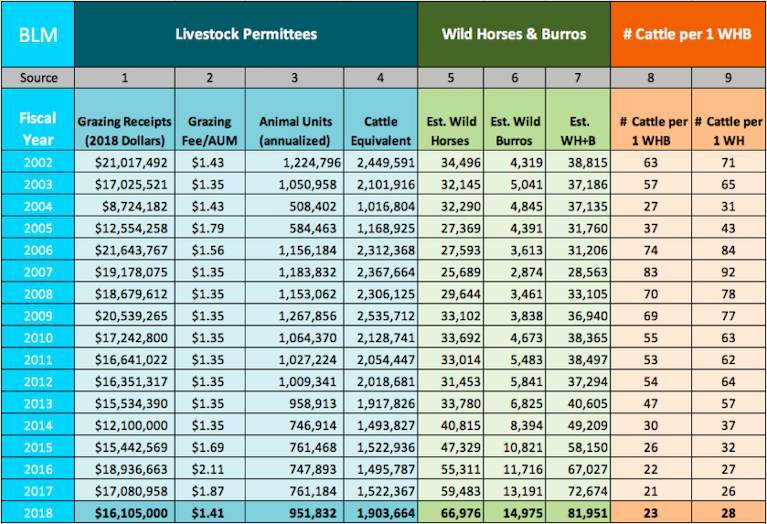 The below spreadsheet converts grazing receipts reported by the BLM for private livestock grazed under the public lands grazing program, allowing a direct head-to-head comparison between the number of wild horses (WH) estimated by the BLM and permitted cattle grazing from 2002-2018 (see column 9). What does the data show? Cattle historically outnumbering WH by a factor of 71:1 (in 2002), 92:1 (2007) and 28:1 (2018). All data BLM. Compiled by dailypitchfork.org. This isn’t the story the BLM tells the public. In fact, the BLM doesn’t publicly report subsidized livestock numbers. It hides them, instead spinning a story of overpopulation and overgrazing by wild horses to justify costly WH roundups, removals, sterilization and sale/euthanasia proposals. The column 9 ratios prove that justification to be false. And the ratios low-ball how many cattle actually compete with WH for water, forage and land, since grazing fees are calculated according to self-reported rancher AUMs and do not reflect underreporting and trespass grazing (like the more than $1 million that Cliven Bundy owed in back grazing fees in 2014). So the actual number of subsidized, privately owned livestock on public lands is likely much much higher. Beef produced on public lands constitutes just 1.9% of the nation’s beef supply according to Erik Molvar, the director of the environmental group, Western Watersheds Project. Public lands ranching subsidizes large livestock operations owned by millionaires and billionaires; less so mom-and-pop ranchers. 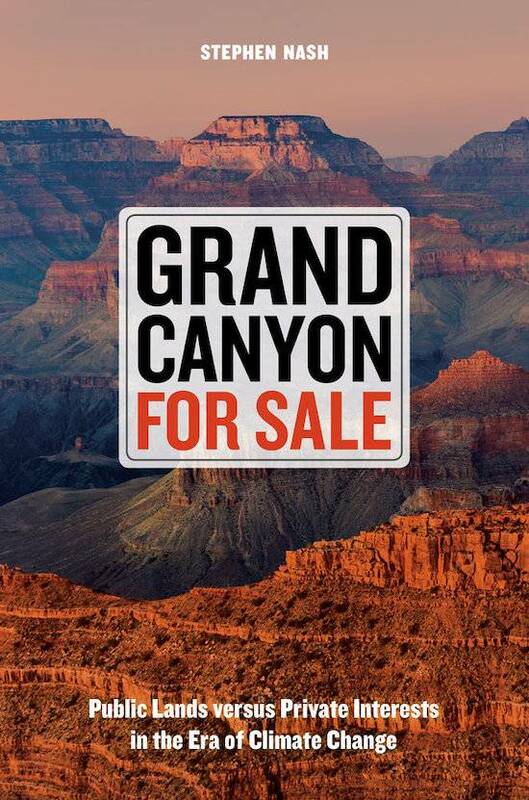 As reported by New York Times science writer Stephen Nash in his 2017 book, Grand Canyon for Sale, “Some grazing allotments are shared among several permittees; some permittees control several allotments; sometimes it’s just one allotment, one permittee. About 15,000 individuals and corporate entities hold public-lands grazing permits. The top 1% of them — only some 152 permittees — hold interests in an astonishing expanse, about a third of the total BLM grazing land area: some seventy-seven thousand square MILES. The next 5 percent of them hold about the next third of the total land area. The bottom 94 percent — about 14,000 permittees — account for only the final third of the BLM’s public grazing lands. The identities of the permittees are sometimes obscured by corporate names, but data provided by the BLM shows that the folks leasing great swaths of public land to graze their cattle and enjoy enormous government subsidies include both people and corporations on Forbes “Billionaires” and “Richest Americans” lists (see p. 138 or click here). When advocates claim that livestock outnumbers and out-grazes wild horses on public lands, this is not an emotional argument or an opinion. It is an argument based on the above data from the BLM and other government sources — data that the BLM doesn’t make available to the public and media, because it doesn’t want them to know…about the cattle, their owners, the damage they cause, and the massive subsidies they are taking from average Americans. Column (1) BLM budget justification reports. 2018 $ are estimated. 2002-2017 are actual. (2) BLM website (3) calculated by dividing column 1 by column 2, then by 12 (4) multiply column 3 by 2 to account for 1 animal unit = 1 cow and her calf or 1 horse (5-6) BLM website (7) total columns 5+6 (8) column 4 divided by column 7 (9) column 4 divided by column 5. All data compiled by TheDailyPitchfork.org.